You are not logged in. 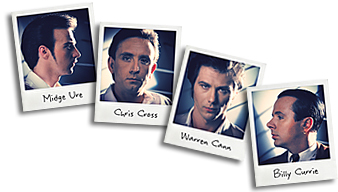 [Log In] Ultravox.org.uk » Forums » Music » Ultravox » Gary Barlow guesting on the new album? #44658 - Sat, 23 Apr 2011 23:27:00 Gary Barlow guesting on the new album? #44659 - Sat, 23 Apr 2011 23:59:00 Re: Gary Barlow guesting on the new album? #44660 - Sun, 24 Apr 2011 00:52:00 Re: Gary Barlow guesting on the new album? Be sure - that was just a joke! #44661 - Sun, 24 Apr 2011 04:27:00 Re: Gary Barlow guesting on the new album? please let this be a joke!! the integrety of the greastest band ever should not be demeicrated by memebers of bad boy bands!!! #44662 - Sun, 24 Apr 2011 17:19:00 Re: Gary Barlow guesting on the new album? #44663 - Mon, 25 Apr 2011 00:12:00 Re: Gary Barlow guesting on the new album? PS the only thing I have to ask Tom is why you were looking on a Take That Forum first rather than a brilliant synthpop music site such as The Electricity Club?? #44664 - Mon, 25 Apr 2011 21:00:00 Re: Gary Barlow guesting on the new album? Indeed it was an April Fool - however it seems to have been taken a little more seriously by Take That fans (reading the TT forum recently - and chuckling...) and the general feeling is "hey the midge bloke is quite talented.."
They seem quite open to the idea! #44665 - Tue, 26 Apr 2011 03:17:00 Re: Gary Barlow guesting on the new album? Ah well, I should have looked on your superb website first and then read the confession! But I literally did just stumble across the post on the take that forum and thought it was worth posting here for entertainment purposes! I too was sceptical but then again, perhaps it isn't as ridiculous an idea as it sounds. If it had been true, it would certainly have generated some publicity for the new album! #44666 - Tue, 26 Apr 2011 04:35:00 Re: Gary Barlow guesting on the new album? If it had been true, it would certainly have generated some publicity for the new album! The funny thing is, it's false and it's generated publicity for the album...it's one of TEC's highest viewed articles this month and still doing the rounds. It's been all over Facebook too! I have to admit, it was such a believable story, that's why I went with it as an April Fool. Someone has actually remarked to me that I secretly want it to happen. Well, I did list a Take That song in our 'Top 30 of 2010' so maybe I was asking for it. In it, I also happen to comment that HURTS "Stay" is how I came up with my 'source' quote.